In 1949 Sheaffer introduced a line of pneumatic-filling pens, in which the ink sac was emptied by air pressure generated by depressing a plunger. The pressure was automatically released once the plunger was fully depressed, allowing the sac to fill. "Touchdown" was the name given these simple, efficient, and elegantly engineered pens. 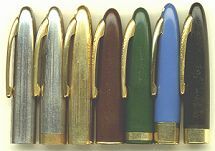 The first Touchdowns were large, thick pens with correspondingly large two-tone nibs, exemplified by the 1949 Sentinel above. After only one year, however, the line was slenderized; the redesigned pens were termed "TM", for "Thin Model". Although successful, this line was itself in production for only a few years – although the most economical models remained in the lineup for much longer. In 1952 Sheaffer released the Snorkel, arguably the most mechanically complex fountain pen ever mass-produced (a Signature model with gold solid gold cap band is shown above). The Snorkel was a slightly lengthened Touchdown equipped with a retractable filling tube running axially through the feed, which enabled the pen to be filled without ever dipping the nib in ink. The Snorkel remained in production throughout the '50s and in some cases into the early '60s; surviving examples are plentiful. Repair is straightforward but somewhat burdensome, due to the complexity of the mechanism. The central component of the Snorkel mechanism is the sac housing assembly. An early production example appears at top; the version below it is far more common (click on the picture to enlarge). The sac itself is conventional, but is attached to a stiff rubber plug into which the Snorkel filling tube is inserted. The plug is crimped into place, making sac replacement a bit of a chore -- especially when the old sac must be scraped off the inside of its metal housing. Note that many sellers offer "working" Snorkels that have not had their original sacs or seals replaced. A leaky point seal may go unnoticed for some time, but will allow ink to be sucked into the pen's mechanism causing rust and corrosion. A leaky sac will usually be noticed pretty quickly because of the resulting mess, yet can also lead to internal damage. Nonetheless, the work involved in Snorkel sac replacement leads many to keep old sacs that seem "good enough". We always put in fresh sacs, since a sac that might have seemed good enough usually turns out to be anything but once removed from its housing, as shown below. Above, details of Touchdown and Snorkel nib options. 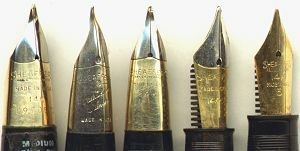 From left to right: two-tone large gold Triumph from first-year Touchdown; palladium-silver alloy Triumph; two-tone gold Triumph; two-tone gold open nib; single-tone gold open nib. The number of variations and their names can be confusing. The chart below should be of assistance, but don't be surprised if we've made some errors in compiling it! Assorted cap variations, left to right: Sovereign, Sentinel/Clipper, Crest, Craftsman, TD Admiral, Valiant/Statesman, Saratoga. Touchdown and Snorkel desk pens were also made, with an enormous range of bases. The short "Tuckaway" pens with their short clasp clips were not produced as Snorkels, and indeed are fairly scarce as Touchdowns (most were made as plunger-fillers); their model designations generally follow the pattern of the chart above. The PFM (Pen For Men) was introduced in 1959 as an oversized addition to the Snorkel line. It was not a success at the time, although it is quite popular among collectors today. For more, see Sam Marshall's excellent article, "Snorkels and PFMs", The PENnant XVI/2 (Summer 2002), pp. 11-15.